So I'm back, with my ears still ringing. and they would finish fourth again. The match was a harbinger of a pedestrian season, as the team drew 1-1. The result flattered Barca, as their goal was an own-goal by Rayo and Rayo also managed to hit both posts with one shot late in the game. Before Saturday, that was the sum total of Barca matches that I had attended in person. I was also motivated by the historical implications of the match. For Barca, this was the chance to make their definitive case as one of the greatest club sides of all-time. Three Champions League titles in six years is no small feat, especially when no team as repeated since the creation of the Champions League from the European Cup in 1992. Winning the third of those titles against Manchester United – the kings of England – at Wembley would be a colossal exclamation mark at the end of a season that was preceded by the nucleus of this Barca side winning the World Cup and included the famous 5-0 win over Real Madrid that kicked the “greatest team ever?” discussion into high gear. Additionally, the number of players and coaches involved made this a target rich match in terms of telling my grandkids “I saw this guy live”: Sir Alex Ferguson, Ryan Giggs, Paul Scholes and Edwin van der Sar in their final games,* Wayne Rooney, and the Ferdinand-Vidic pairing on one side; Pep Guardiola, Gerard Pique, Carles Puyol, the Xavi-Iniesta fulcrum, David Villa, and Leo Messi on the other. As a history major who still has regrets over my decisions not to go to the Braves game that turned out to be Randy Johnson's perfect game, as well as the 1996 Michigan-Ohio State game in Columbus (I sold my ticket thinking that Michigan was going to get slaughtered and that anyone wearing maize and blue would be drawn and quartered), this was too much to pass up. * – The first Champions League Final I ever watched was Ajax 1 Milan 0 in the 1995 Vienna Final. Van der Sar was the goalie for Ajax in that match and the announcer (JP Dellacamera, I think) made a point of noting that he was young and would be nervous playing against a Milan side that was in fully dynastic mode. Van der Sar had a nervous moment or two in the first half, but settled down and ended up with a clean sheet against the defending Champions League winners. There was a nice closing of a circle that van der Sar played in the first Final that I watched and then his final match was the first Final I attended. Being a risk-averse person who had spent $120 on a ticket that I described as once in a lifetime and who was also lucky to have gotten the right to buy a ticket (96,000 of Barca’s 175,000 members applied for the 16,000 tickets available to members, which means that I won a one-in-six bet),* I was on the train to Wembley three hours before the match. * - One nice thing about Barcelona: every member has an equal chance to get tickets to big events like Champions League Finals. Most clubs would reserve their allotments for season ticket holders. Barca has a democratic structure, so all members can apply. I suppose that a guy who went to 15 games at the Nou Camp this year could be annoyed that someone like me didn't go to a game all year and then got to go to the Champions League Final, but I watch the games, I buy the jerseys (or at least I did before the new sponsor), and I click on the links. Surely I count for something. Barca's structure does have its downsides - the public tapping up of players during elections is one obvious examples - but there are a lot of upsides to a club owned by the members. I noticed more Barca fans in the street headed toward the game and surmised that the United fans would be in the pubs until shortly before kickoff. This played out in the stadium, as the Barca end was full and singing well before the United end. Similarly, I saw more Barca fans on Friday when I was tooling around London, but I chalked that up to the fact that Barca fans would be more likely to see the tourist sites (Tate Modern, Tate Britain, and the British Museum, in my case) than United fans who have probably been to London on dozens of prior occasions. Barcelona’s performance in the second half is going to be talked about in hushed tones for a while, and deservedly so. The most impressive thing, to me, was that they won by doing exactly what they wanted. Matches at this level tend to be decided, if not by penalties, then by lucky bounces (Xabi Alsono getting his penalty rebound in ’05, Inzaghi deflecting Pirlo’s free kick in ’07), sudden breakthroughs (Iniesta in the World Cup final), goals squeezed in after a scramble in the box. Yesterday, though, each of Barcelona’s forwards scored from open play, with each of their midfielders contributing an assist. They had 63% of the possession and 12 shots on target (to one for Man Utd—Rooney’s goal). Messi scored in England, even if it was in London on a Saturday night. Valdes didn’t have to make a save. They played exactly their game, and their game worked exactly the way it’s supposed to, and the second-or-third-best team in the world was basically powerless to frustrate them. If soccer is about realizing a collective intention against the limitations imposed by the game and the resistance imposed by the opponent, then Barcelona epitomized soccer yesterday. Forget the backlash, your anti-mass-media skepticism, conspiracy theories, blog rage, and Heineken. If you love sports you were lucky to watch that. * – I was struck by two aspects of the game that were especially pleasant after years of going to games in the US. First, because the game is non-stop, you don’t lose the emotional high from scoring. Nick Hornby is right; there is a quasi-sexual feeling to the release after your team puts one in the back of the net. It’s not quite like your team scoring a touchdown because the moment is more explosive. More importantly, the goal is followed by a celebration and then the opponent kicks off. There is no cold shower of commercial break-kickoff-commercial break. Second, there is nothing in the stadium to distract fans from the game. Wembley is as expensive and modern a stadium as there is in footie, but it has two video boards that would make a Texan guffaw. Those boards play a live feed of the game and occasional highlights. That’s it. No wrap-around boards with stats. No Kiss-cam or Tesco Price Check. The PA announcer does nothing save for announcing goals, cards, and subs. And keep in mind that the Champions League Final is the European Super Bowl, so if there were ever a chance, in the words of Mortimer Duke, to “get back in there and sell, sell,” this would be it. If the 5-0 thumping of Real in November was the opening opening argument for Barca’s “best of a generation” case, then the second half of the Final was the closing argument. 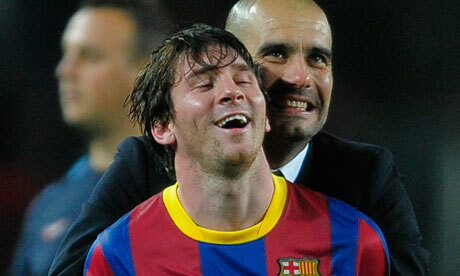 Barca quickly pinned United back and within 11 minutes, Leo Messi had put the Blaugrana ahead. 13 minutes later, David Villa scored with a wedge shot that would have made Seve Ballesteros proud and Barca spend the last 20 minutes passing the ball around, content that three goals would be enough. United didn’t muster a single shot on target in the second half. In the end, the Barca players were on another podium, receiving another Champions League trophy with the club’s name on it. Puyol’s decision to let Eric Abidal lift the Cup as captain was a nice touch, reminiscent of Andres Iniesta’s tribute to Dani Jarque after scoring the winning goal in the World Cup Final. As best as one can tell about celebrities with managed images, these Barca players seem like good guys. In the end, it has to be said that United are a good match-up for Barcelona. For one thing, the Red Devils were so successful over the course of the year because of their depth, but in a one-off final, that depth doesn’t matter so much, especially when the teams have had weeks to prepare and and rested and healthy coming in. (The American sports analogy would be to a team with five great pitchers in the starting rotation, a strength that is somewhat pearls before swine in October.) For another, United are incapable of playing the negative, destructive style that gives this Barca team trouble. Jose Mourinho concluded that the way to handle Barca was to pack the midfield with defensive players, starting with an aggressive central defender (Pepe), and then to hope that a counter could produce a 1-0 win. * United do not have that personnel, especially with Darren Fletcher not entirely fit, and Alex Ferguson probably sees that style as incompatible with his team’s image (although United’s approach in the first leg of the 2008 semifinal against Barca came close). United brought a sterling defensive record to Wembley, but without a proper defensive screen, even a terrific central defensive pairing like Vidic and Ferdinand (a pairing that was a major factor in United not allowing a goal in the Champions League away from Old Trafford all season) bled three goals in 69 minutes before Barca made the “you’ve had enough” decision. All three goals came from the area in front of the back four that a screen of defensive midfielders would seek to control. The opener was eerily like the opener in Rome: Xavi/Iniesta breaks free from the center of the pitch, has time to pick out the final ball, and hits one to the right to a forward to finish at the near post. It’s to Ferguson’s credit that he tried to play his game and went down trying, but then again, it’s not his job to earn the plaudits of an opposing fan. As the gate agent told me when I was boarding the flight home (subtly dressed in a Xavi jersey and a game scarf; why didn’t I paint my face and have “Cant del Barca” playing on a loop from my phone? ), “football won.” This was a needed tonic for a game struggling through the obvious corruption of its global governing body. It was also important for a team that had disgraced itself to a degree with the play-acting in the first half of the first leg against Real. I’ll defend the histrionics to a degree as a rational response to a noxious strategy employed by the worst person in the world, but in the end, when your players repeatedly go to ground holding their faces after not being touched in that area, then something’s amiss. This game had none of that. Not much fouling, no surrounding the ref, no play-acting, no diving, no playing for penalties, and no surrounding the ref. Hell, Busquets only went down twice. If I were trying to get a friend on the fence into footie, I would not have shown him or her the matches against Real (although the fourth match [not coincidentally the one without Jose] was a pretty good one), but the Champions League Final would be a persuasive advertisement. 1. It briefly appears as if Xavi can dance, but then he thinks better of shaking his hips Shakira-style on a stage in front of thousands of people. 2. Bojan is a Gator fan. 3. For the moment, I'm not concerned about Shakira being Yoko to this Barca side's Beatles. I have had a lot of work to get done before my trip to the Feisty Goat. Full review of Wembley '11 coming next week. Mark Teixeira (33 years old, $22.5 million). Tex has five years left on his contract after this year. I think this contract could actually work out fine. Tex plays hard, he’s a switch-hitter, he’s good defensively, he will take a walk — I think his skills could stretch out. Where would you draft Tex from that list? Third? Fifth? Last? And you can throw in Ike Davis, Justin Smoak, Matt LaPorta, the surprisingly hot Gaby Sanchez, the now-third-baseman Kevin Youkilis, the surprisingly sturdy Paul Konerko, the former MVP Justin Morneau and a bunch of other young guys. Tex’s all-around play and the hope that he will age well might move him near the top. But we seem to be moving to a time where just about every team in baseball will have a first baseman who hits roughly like Mark Teixeira. So distraught at being left out of the team was the 23-year-old that he couldn’t muster the energy to celebrate a title in which he has been the main protagonist. Without Messi, there would be no league title at Barca this season, but the No.10 was in his own world, sitting on the sidelines. And sulking. By that time, news had filtered through of Cristiano Ronaldo’s two goals at Villarreal. Those strikes saw the Portuguese move a full seven clear of Messi in the race for the Pichichi (eight according to Marca), as well as emulating the Argentine in reaching a half-century of goals for the season. Messi could even be overtaken by the Portuguese now in all competitions – and he did not look amused. After the game, when the team was being presented with the league trophy in a colorful celebration, I was banging away at my computer. My friend and colleague from BackPage Press, Martin Greig, tapped me on the shoulder. "What's up with Messi?" he asked. There he was among the Barca squad, the only one who kept on his tracksuit top and trousers rather than joining his teammates in their playing kits to throw red peppers all over the place. He drifted away from Pep Guardiola's lads, who were singing, dancing and generally shaking off the tension of a long, hard football campaign. If you had taken a snapshot, it looked like each and every player was holding a winning lottery ticket but Messi had lost his and was shuffling about looking for it -- downcast and preoccupied. Now, I am not trying to overdramatize this. Messi isn't ticked off with his team, his manager or life in general. It is just that he literally cannot stand missing out on a game, even one that has no bearing. So on Sunday, with the league won the week before, Messi was left on the bench, having to watch an understrength Barca trundle along to a goalless draw with Deportivo. The next day, I asked Josep Maria Minguella, the football scout and player agent who discovered Messi for Barcelona, to confirm my suspicions. He did. "Leo lives to play, every second, every minute, every match -- it's what he thrives on. He hates not taking part in any game. That's one of the best things about him." Shockingly enough, I’m going to side with Hunter. Messi knows that the media love winners. If Barca win at Wembley, and especially if Messi scores in the victory as he did two years ago, then Ronaldo beating him for the Pichichi and the European Golden Boot will not matter. In fact, Ronaldo’s achievement will almost become part of the negative narrative regarding Cristiano, namely that he is a selfish player who looks to set himself up, whereas Messi is a team player who makes goals for those around him as well as himself. Also, the fact that Ronaldo has gone on a scoring spree after Barca effectively clinched La Liga will add to the narrative that Ronaldo isn’t a big game scorer. This second narrative shouldn’t have much weight after Ronaldo scored the winner in extra time in the Copa del Rey Final, but old stereotypes die hard. Some people in England still levy that criticism at Messi after he has scored in a Champions League Final, hit a hat trick in a Clasico, assisted the winner in the Olympic Gold Medal Game, and now scored the two key goals against Real Madrid to send Barca to London. To come back to the original point, if Messi has any degree of self-awareness (and he certainly seems like a perceptive guy), then he knows that sitting out the last two games of the La Liga season will not matter if he delivers the good against Manchester United. "'What were you thinking? What motivated you to do this?'" Marsh said. "If that didn't matter, you wouldn't have a hearing. ... The body language, and how sincere the individual is, it matters a great deal. It is the show." Or, put another way, the NCAA Committee on Infractions can use Tressel’s personal demeanor to make a judgment: (1) against the weight of the evidence; and/or (2) consistent with their personal prejudices. Total defense also is important. A lot of it is a function of how many plays you give up. In our league, you have Oklahoma, Oklahoma State, Texas Tech, Baylor -- all these guys are no-huddle, up-tempo teams, so you are going to play more snaps and total defense gets thrown out. Instead, I am more concerned about pass-efficiency defense and third-down defense. but then he cites third-down defense (as do a number of other coaches), a stat that Football Outsiders has shown (at least on an NFL level) to be a heavy luck element. Teams that do disproportionately well on third down tend to regress the next year and vice versa. Conceptually speaking, it makes no sense to focus on third down efficiency because there's no reason why third down is any more important than second or first. Can anyone conceive of a good reason why a defense would be bad on first and second downs and then magically get better on third? Maybe a defensive coordinator saves up his best stuff for third down after playing vanilla on downs one and two? Put another way, why do we pay special attention to third down conversion defense, but not to fourth quarter defense? The general sense that I got from the article is that college football is a barren wasteland for statistical analysis among coaches. It's possible that some of these coaches have advanced stats for measuring their teams' performances and they just aren't sharing those stats because they want to retain an edge, but there is no hint of that sort of collusion. I doubt that dozens of baseball managers would say that they use batting average and RBIs to measure players and if they do, most GMs almost certainly don't. Since college football programs don't have general managers, it falls on the coaches to seek out and use better stats, but it appears that they don't, although at least some of them are curious enough to have read studies on the importance of turnover margin. And here's the funny thing about innumeracy on the part of coaches: they have a ready-made solution at their universities. Do you really think that there aren't a dozen students (or professors) in the stats department at Alabama who would be thrilled to apply their regression analysis tools to help Nick Saban understand what stats have the strongest correlation with winning? Or what traits are most important for recruits at given positions? I'm not saying that coaches should use these sorts of analyses to make all of their decisions. As in baseball, stats are best used in conjunction with traditional scouting and coaching, and that's in a sport that lends itself to statistical analysis more than football. Likewise, I'm not saying that coordinators need to start spouting off about adjusted yards per play or S&P. Their jobs are still primarily to develop schemes and then to coach players to perform their roles in those schemes. However, there can be no doubt that they would be more effective at their jobs if they had better guidance as to what numbers matter. While I was rooting around hockey-reference.com looking for attendance numbers, I came across this chart that nicely illustrates my problem with modern hockey, or at least one of my problems. Look at the change in save percentages over the years. In 1983-84, the first year for which save percentage is tracked, goalies saved 87.3% of the shots that they faced. The save percentage grows gradually over time, first getting above 90% after the 1993-94 season, which happens to be the year in which the NHL's popularity was at its modern apex, at least in the United States. Now, there were a lot of factors that led to hockey reaching that zenith: the Rangers ending their Stanley Cup drought and the attendant overreaction by the Northeast media; a dramatic set of post-season series; Wayne Gretzky and Mario Lemieux both being active, established stars (although Gretzky was coming towards the end of his career); etc. I would add to that list the fact that offense and defense were in balance. I find the reduction of scoring based on bigger goalie equipment to be a turn-off because there is no skill involved in picking the right accessories and then getting dressed. Scoring is down and fielding percentages are up in baseball, but I have no problem with that. If teams are giving up fewer runs because they are deploying centerfielders and shortstops who get to everything, then I'm going to enjoy watching baseball more to see those athletes in full flight. (I'll acknowledge that the emphasis on better defense has come with the price of more at-bats for punch-and-judy hitters, so there is a trade-off.) In contrast, it's not exciting to watch a grotesquely-clothed goalie stop 19 of 20 shots without having to show quick reflexes. I'm not denying that goalies have to have great reflexes to play the position, but the same would be true for baseball players if they suddenly started hitting .400 with regularity because they got to use aluminum bats. Bringing the discussion back to the soon-to-be-departed local professional hockey collective, I have to credit something that Steak Shapiro said. (There is a Jewish prayer called the Sheheheyanu that is recited whenever something good happens that has not happened for a while. That prayer seems appropriate at this stage.) When discussing the potential sale of the Thrashers several weeks ago, Steak hypothesized that the team has had trouble finding a local buyer in no small part because that buyer would not just be buying a franchise with a dwindling fan base and no profile in the local sports market, but they would also be buying into the NHL. In light of the fact that the league has allowed its product to be devalued by a basic equipment issue, that reasoning is persuasive. * - Note that shots per game have remained relatively constant over time. It's not as if scoring is down because coaches are playing too conservatively. If that were the case, then shots would be down. Instead. the decline in scoring has to be primarily caused by goalies' equipment. I look forward to John Hollinger articles about the Hawks because Hollinger has a statistically-oriented approach and he’s that rarest of national writers who shows more than a passing interest in the local professional basketball collective. Hollinger is typically pessimistic realistic about the Hawks and he has written some of the best criticism of Atlanta Spirit, so it was something of a surprise to see this title to his article the morning after the Hawks took their umpteenth whuppin’ of the season, thus ending an unexpectedly interesting playoff run. In doing so, this also opens up new options for the Hawks that we hardly saw all season. Atlanta can play Teague at the point, Kirk Hinrich at shooting guard and Joe Johnson at small forward -- a look that puts a top-notch scorer, a defensive ace and a penetrating, ball-pushing point guard on the court at once. Or the Hawks can roll with a Teague-Jamal Crawford-Johnson triumvirate (if Crawford returns) on the perimeter that even the defensive-minded Bulls struggled to match up against at times. Every since Billy Knight first assembled this team, the vision was for a young, athletic team that could get up and down the floor and score in transition. In part, the Hawks have never been good enough defensively to make that happen, but they have also lacked the right point guard to run. Is Teague finally that guy? I had always thought about the potential loss of the Thrashers as a negative for Atlanta Spirit because it lowers the value of their operating rights of Philips Arena to have one major tenant instead of two, but I can see the counter. First, Atlanta Spirit will get an infusion of cash from the sale, which gives them the ability to spend on the Hawks this off-season. * Second, they can focus all of their energies on one team. (Whether that’s a good thing is another matter entirely.) Third, Philips Arena is a cashcow for concerts, so maybe having more available dates will be a net positive. Fourth, the owners will stop bleeding money on the hockey team. They’re bleeding money because of their own mismanagement of the Thrashers, but to paraphrase William Munny, deserve’s got nothing to do with it. This market is big and diverse enough to support both an NBA and NHL team, but if it has to choose between the two, I’ll take the NBA. The city has an established African-American elite and middle class rivaled only by New York, Chicago, Los Angeles, and DC. It ought to have an NBA franchise for which making it to the sixth game of the conference semifinals isn’t a massive accomplishment. * – The difference between the Hawks and Bulls wasn’t so much in the starting fives. Chicago had the best player on the court, but the Hawks have a more balanced lineup. The differences came in all of the accoutrements that a spendthrift owner will buy, namely a coveted head coach and quality pieces on the bench. If the Hawks would have signed Tom Thibodeau last summer and the Bulls would have gone for the cheap, internal option, how would this series have played out? As a practical matter, Thibodeau wouldn’t have been a stylistic change from Mike Woodson (although he’s obviously better at coaching defense) and therefore would have been an unlikely option (not to mention the fact that the Hawks wouldn’t have had the “come coach Derrick Rose” selling point), but the point remains that the Hawks went cheap on the coach. Back in January I did a blog about the rivalry being back. That the hiring of a true Michigan man, and a fine coach, in Brady Hoke would reignite the greatest rivalry in American sport. As usual, Buckeye fans dismissed it. That happens a lot when fans don't want to hear something. Reignite, eh? That verb implies that the fire has gone out of the rivalry as Michigan has circled the drain since the 2006 #1 versus #2 game. And that’s when it occurred to me: Alabama-Auburn has surpassed Michigan-Ohio State. I don’t see how anyone can claim with a straight face that Michigan-Ohio State is the best rivalry in college football right now, let alone in all of American sports. Michigan-Ohio State and Alabama-Auburn are similar in lots of ways. There is great history for the games. Anytime something major happens in the game, fans from both sides can usually recall a similar situation in a game in the past. Both rivalries have a fixed spot on the calendar: the last regular season game. Both rivalries feature a good amount of antipathy between the fan bases, with rampant stereotyping to make things saucy (although Alabama-Auburn truly goes the extra mile into Celtic-Rangers territory). The one factor that always gave Michigan-Ohio State an edge was that the stakes were usually higher. Throughout the years, conference titles were more often at issue for one or both teams in the Michigan-Ohio State game. To use another footie analogy, Michigan-Ohio State was Barca-Real because the two teams dominated their league, whereas Alabama-Auburn was Liverpool-Manchester United, a top rivalry that suffered a little bit because it took place in a deeper league. With Michigan’s decline and Auburn’s rise, this is no longer the case. Alabama and Auburn have won the last two national titles. Their last two games have been classics. Meanwhile, Michigan hasn’t been in the national title picture since 2006 or the Big Ten title picture since 2007. Moreover, with a dark cloud hanging over the Ohio State program, it’s possible that the Bucks will be joining Michigan on the sidewalk as the parade goes by. The other comment by Long that bears scrutiny is the concept that Michigan will be back because Dave Brandon hired a “Michigan Man.” Again, this concept annoys me. Why is Alabama-Auburn so hot right now? Because Alabama hired Nick Saban, who had no connection to the school before he took the head coaching position, and Auburn hired Gus Malzahn, who not only had no connection to Auburn, but also represented a repudiation of Auburn’s traditional offensive approach. The South has a reputation for being provincial, but you wouldn’t know it from looking at the hiring decisions made by Alabama and Auburn, as opposed to Michigan. Michigan overreacted to a good decision that had bad consequences (hiring Rich Rodriguez) by elevating program ties over all other criteria in its coaching search. That’s not how Alabama and Auburn won national titles, not to mention LSU and Florida, both of which hired head coaches who had no prior ties to those schools. There’s no doubt that the Rodriguez disaster took the sheen off of the Michigan-Ohio State rivalry and denied advocates of the rivalry their best argument in distinguishing it from Auburn Alabama. That said, if the lesson that Michigan and Ohio State take is Ausländer Raus!, then the rivalry will remain second fiddle to Alabama-Auburn. And no worries about having to give this one back because we paid Leo Messi's father $180,000. Newsflash: if he is Uncovered, Julio Jones Can Score Touchdowns! Doug Farrar, you aren’t making me feel any better about the Julio Jones ransom with this article. Farrar’s theme is that the Falcons were terrible at hitting big plays in the passing game and Jones will address that weakness. As evidence for his claim, Farrar diagrams Jones’s touchdown against Auburn, a play on which he was totally uncovered. I remember watching the play and thinking “holy crap, Auburn’s pass defense is even worse than I thought. They just left Alabama’s best receiver alone in a deep zone.” I did not think “wow, that Julio Jones really is something” and I doubt that anyone else had the same thought. Jones may turn out to be worth the stiff price that the Falcons paid, but it won’t be based on his ability to score when opposing safeties ignore him. Our Pitching is Better Than your Pitching! 1. As one would expect from a pitching staff with Tim Hudson, Derek Lowe, and Jair Jurrjens comprising 60% of the starting rotation, the Braves do a great job of forcing opponents to hit ground balls and they allow very few homers or walks. It stands to reason that this staff would excel at two of the three true outcomes (walks and homers) and be less dominant in the third (strikeouts). That said, the Braves’ strikeout numbers are quite good, in no small part because Brandon Beachy has been a revelation. Beachy is seventh in the NL in K/9, a hair behind Roy Halladay in sixth place. Small sample size, I know, but wow! 2. The Braves have allowed four unearned runs all season. By way of comparison, the average NL team has allowed 13 and the Phillies have allowed nine. 3. As evidenced by that league-leading line drive percentage (not to mention the league-leading number in fewest homers allowed), the Braves are not permitting opposing batters to make solid contact. Put all of this together and you see why the team was willing to let Roger McDowell escape with a two-week suspension for his vaudeville act in San Francisco. You also see that when Dan Uggla and Martin Prado start hitting and if the pitchers can sustain this level of performance, then the Braves will have a legitimate shot at being the best team in the National League. This ($) is how you make an argument in favor of the Julio Jones pick. KC Joyner notes that the Falcons were terrible in the short passing game last year, most likely because none of their receivers could break a tackle or make a defender miss. Jones was excellent in the short passing game at Alabama. In fact, he was better than AJ Green in this department, so he answers a major need for the Falcons. If Jones lives up to his college numbers, then he’ll be able to take some of the load off of Roddy White and he’ll also open up the deep passing game. As it is, Josh Smith at 25 is on his way to being one of the league’s least respected good players, and I hate that. He’s a nice guy, and he’s capable of so much more. If he would play to his strengths — and he has many — he would get his numbers without damaging his team. Being a member of the media, I’m privy to press room conversations. I hear what famous writers say about the Hawks. And the first thing many of them say is, I’m sorry to report, “What is Josh Smith doing?” For that I have no answer. to dominating the fourth quarter of a do-or-die playoff game against the team with the best record in the NBA, the MVP, and the Coach of the Year? Going forward, anything is possible for this team. They could get blown out in the last two games (I'm hardly the only one who watched the game on Friday night and said to myself "same old Hawks") or they could knock the Bulls out and then pose a threat in the NBA's final four. Welcome to the series, Al Horford! Horford is my favorite Hawk, but he was killing the team in the first three games. The team has no chance to win if he doesn't win the matchup with his college teammate Joakim Noah. Through three games, the team's best player had scored 25 points total on 12 of 31 shooting and had shot a grand total of two free throws. Last night, he scored 20 on nine of 11 shooting and was a major part in the run that won the game in the fourth quarter. Far be it from me to criticize the reigning MVP, but Derrick Rose didn't make good decisions in the fourth quarter last night. He went from being a point guard to attempting an imitation of Allen Iverson, circa 2001. Rose ended up taking more shots than the rest of the Bulls' starting lineup combined. Carlos Boozer showed signs of life in the third quarter, but Rose barely looked his way in the fourth. Luol Deng also faded into the background. When the prospect of the Hawks in the Eastern Finals was a ludicrous proposition, I was prepared to root for the Bulls as an acceptable alternative to the Celtics and Heat, but if they are going to imitate the '01 Sixers, then I'll just root for a meteor. The crowd was great last night. That said, if the Hawks do somehow win Game Five, every Hawk fan who lived through the 80s with be thinking about one game when the teams come home: Game Six against the Celtics in 1987. Let's keep Cliff Levingston as far away from Philips as possible. In short, Playmaker accounts for both the style of the offense and the level of competition. Jones’s pedestrian numbers go into that system and come out with the projection that he’ll be a pedestrian receiver in the NFL. As FO acknowledges, their system is by no means perfect. We are simply talking about probability here. Combining the history of receivers taken in the top ten spots in the Draft and Jones’ numbers leaves us with the conclusion that the odds are against Jones producing at anywhere near the level that would justify his price tag. None of these four receivers played in pass-heavy spread offenses and they did not play with quarterbacks who would go onto success in the NFL. With that groundwork out of the way, there are two issues that jump off of the table. First, Jones’s yards per catch is lower than any of the three receivers on the list. Second, he caught fewer touchdowns. The touchdown issue is especially worrying when you account for the fact that Andre Johnson - the only one of the three whose TD total is close to that of Jones - only started for two years in college, whereas Jones started for three. Those 15 touchdowns look a lot more like Troy Williamson (13 TDs in three years as a starter at South Carolina) than they do Johnson & Johnson or Fitzgerald. Thus, we have to go on faith that Jones was a decoy for most of his time at Alabama and that he will thrive when he has Roddy White on the other side of the formation as opposed to Marquise Maze. I’d rather have more than faith in my corner when trading five picks for one guy. One last thought: for the first time, I’m a little anxious for the NFL owners and the NFLPA to reach a deal. Previously, I was ambivalent about the prospect of a lockout eating some or all of the season. I do like watching NFL games, but on the other hand, a fall where college football doesn’t have the share the spotlight is an appealing thought. Now, I’m so interested to see how the Jones gamble pays off that I want a resolution so we can start getting reports on how the Falcons’ passing game looks in August. Apologies to Edward Rooney for the title. I was not expecting an offensive performance from Real Madrid on Tuesday for a number of reasons. First and foremost, I remember well Chelsea's timid performance at the Nou Camp in 2006 after a Mourinho side had lost the first leg at home. Just like this tie, Mourinho's team needed a two-goal win on the road. Just like this tie, Mourinho's team never played more than one striker on the pitch, despite a wealth of attacking options on a very expensive bench. Mourinho has successfully beaten down expectations for the attacking intent of his teams against Barcelona so much that when Real appeared in a 4-2-3-1 (not exactly the most offensive formation in modern football, although as Jonathan Wilson will point out, the instructions to the players matter more than the number of ostensible attackers in the formation) and didn't camp out entirely in their own half, they were rewarded with plaudits from the announcers for a more positive approach. Yes, and OJ graduating from double murder to armed robbery was an improvement, but that doesn't make him a good guy. That positive approach resulted in a whopping one shot on goal and only four attempts in the direction of Victor Valdes's net. When you need a two-goal win and you don't force the opposing keeper into a single save, then you don't get the blame the refs. When you need two (and then three) goals and you never play more than one striker and three attacking midfielders (just as in 2006, both of Real's subs were like-for-like: a striker for a striker and an attacking midfielder for an attacking midfielder) and you never change from having a four-man backline screened by two defensive midfielders, then you are, um, there's a euphemism for a cat that comes to mind, Jose. Mourinho does deserve credit for one accomplishment. His ravings about the UEFA/Unicef conspiracy to knock his much-beloved teams out of Europe clearly had an effect on Frank de Bleeckere. De Bleeckere had no fewer than three obvious opportunities to give Ricardo Carvalho an early shower. Carvalho got a deserved yellow card on 13 minutes and then proceeded to commit a number of similar (if not worse) offenses on Leo Messi throughout the half. Not wanting to listen to more kvetching about playing with ten men, de Bleeckere looked the other way. Yes, he gave Barca a pair of calls to snuff out two of Real's rare attacks, but at best, those were make-up calls. I'm sure that Mourinho will see it in exactly the same way when he talks to the media this week. The defensive responsibility for the goal falls primarily on Marcelo for not tracking Pedro's run, but that run came through the area vacated by Carvalho. Carvalho was originally out of position from trying to stop Dani Alves's run, but watch as he takes a step or two towards Messi instead of occupying the zone through which Pedro runs. The danger that Messi's work as a false nine presents is that he can pull central defenders out of position, creating the space for the wingers - Pedro and David Villa - and the offensive midfielder - Xavi and Iniesta - to make runs through the vacated space. United will need a midfiuelder to deal with this threat, as well as two midfielders to handle Xavi and Iniesta. This is the approach that Mourinho concocted and it worked at times. You aren't going to out-pass Barcelona, so you might as well try to negate them and then hit them on the counter. The problem with playing three midfielders with defensive responsibilities is then it does not leave room for the Rooney-Chicharito pairing at forward along with two wingers (unless Rooney gets defensive responsibility to harry Xavi or Iniesta). How does Ferguson resolve this question? He has three weeks and two days to mull it over. Before we leave the NFL draft, we need ask a simple question: Were you the Falcons, would you rather have had the second-best-at-worst receiver in this class or the eighth-best defensive end? Because the rationale for trading up to take Julio Jones lies therein. Gee, if only it were so simple. The Falcons were not choosing simply between taking Julio Jones or one of the defensive ends who would have been available with the #27 pick. No, they were choosing between those two options, only with four additional picks, including a first-rounder and a second-rounder behind door number two. One can just as easily make a simplistic argument in the other direction by saying that the Falcons made the wrong decision in a choice between one player or five. Bradley also assumes without evidence that the Falcons are going to have a late first-round pick in next year’s Draft. He is overrating a team that was outgained on a per-play basis and then lost by 863 points in its first playoff game. Julio Jones will start as a rookie. That’s a given. It’s all but a given he won’t be a bust. He’s too gifted and too focused. Jones was a high school star and played college football at the highest level, so he’s accustomed to the pursuit of excellence. By my informal count, the number of busts (Ginn, Williamson, Mike Williams, Reggie Williams, Charles Rogers, David Terrell, Koren Robinson, Peter Warrick, and Travis Taylor) outnumber the stars (Calvin Johnson, Fitzgerald, and Andre Johnson) who have been taken in similar positions. (Neither Crabtree, nor Heyward-Bey are off to starts in their careers that indicate that they will be anything other than busts, but for the sake of argument, I’ll give them grades of incomplete.) If the recent past is a guide, then it is three times more likely that Jones will be a bust than it is that he will be the player that Bradley describes. If Bradley is thinking clearly, then he will counter with some variation of the following: “Michael, none of the busts on your list had a quarterback throwing to them with anything close to Matt Ryan’s ability. Most of your busts are the victim of circumstance.” That may be true, but there are two problems with this argument. First of all, if their lack of success was a function of teammates, then one would expect one or more of those receivers to have flourished when they moved to different teams. The only guy who could possibly be described in that manner is Mike Williams. Second, if wide receivers are simply a function of their quarterbacks, then it makes no sense to invest five good picks into one receiver. Rather, you would simply bide your time and wait for the chance to take your version of Desean Jackson, Mike Wallace, or Wes Welker later in the Draft. You know, like the good teams do. What Happens when a Jump-shooting Team Makes its Jumpers? This. The Hawks just stole home court advantage from a team that finished a mere 18 games ahead of it over the course of the regular season. Were the Hawks merely coasting for most of the regular season, knowing all along that they have an extra gear and that their season would be dictated by their performance in April and May? Viva the meaningless 82-game regular season! Can't say enough about Jeff Teague. Man was balling tonight. Again I have to mention that his efforts defensively ensured that, not only would somebody actually stay around Derrick Rose tonight, but that Johnson and Crawford did [not] have to die trying. He was 5-11, 2 rebounds, 5 assists, and a single turnover. And he only committed 2 fouls in 45 minutes. Derrick Rose drove at him, on him, shot through and over him, and never got to the free throw line. That's worth mentioning. Honestly, could Kirk Hinrich done better? Teague, who’d seen nine-plus minutes against Orlando, had gone 32 of Game 1’s first 36 minutes and had held his own against Rose. And he kept going. He was the floor when the Hawks broke it open — yes, you read that right — to start the fourth quarter. Johnson was hitting everything, and Zaza Pachulia was doing his grunt work in the lane, but none of this would have matter had Teague not held it all together. By the way, what does it say that the Chicago quotes after the game all cover a lack of intensity by the Bulls and then Larry Drew says that the veteran Hawks had to keep their rookie point guard “motivated and stimulated.” If you can’t be fired up for game one of the NBA quarterfinals, then when can you be fired up? And frankly, a series in which the Hawks reach the Eastern Conference finals for the first time on the strength of a good performance from Teague will feel very strange. It will lead to all sorts of questions as to where was he for the rest of his career, as well as a query as to whether the Hawks’ brain trust has an irrational fear of playing its first round picks. Anyway, let’s cross that bridge when we come to it. The Hawks have won a second-round game for the first time in 14 years and they have a real chance to knock out the NBA’s #1 seed. Joe Johnson played like a guy who deserved the max deal that Atlanta Spirit bestowed upon him. Jamal Crawford was money. Josh Smith made a jumper. The Hawks are up in the series without a big performance from their best player (Al Horford) and without Zaza turning in a vintage irritant in residence performance. In other words, Larry Drew could have counter-measures when Tom Thibodeau makes defensive adjustments to stop Johnson and Crawford. This could be interesting. 1. The Braves are not good at situational hitting, so they struggle to eke a run across when they really need one. 2. The Braves are slow, so they can't manufacture a run in a close game. 3. Bobby isn't a good tactical manager at the end of a close game. 4. Karma is punishing us for 1991-2005. This year, we can add a suspect bullpen back into the mix. We should have seen this issue coming, but the Braves basically replaced Billy Wagner and Takashi Saito with Scott Linebrink and George Sherrill. The club’s approach was that Craig Kimbrel and and Jonny Venters were replacing Wagner and Saito, but then who was replacing Kimbrel and Venters? Thus, the team has fairly reliable eighth and ninth inning guys (although this weekend was not a good one for Kimbrel), but no bridge to them, especially with Peter Moylan injured. How many times has Venters had to enter a game to put out a fire started by one of the other relievers in the pen? You have to hand it to the Braves players. Despite heroic efforts by the manager to lose the game, they managed, barely, to pull this one out and salvage at least one win in the series. Fredi’s utter contempt for what wins in baseball began with his version of Bobby‘s Sunday Surrender lineup. He did start Brian McCann — with no off-day tomorrow and a lefty going, so if you’re ever going to rest him, it’s now — but decided to give a start, at first base, to Joe Mather, who has about as much business in the major leagues as he does leading an expedition to the headwaters of the Amazon. Somehow, it worked out, and no doubt Fredi will inform us that he is a super-genius and should never be criticized or questioned. Watching Mather try to get a bunt down on Friday night was painful. The episode illustrates the facts that the Braves aren’t good at situational hitting (compare the hit and run that the Cards executed in the ninth to tie the game with … well, everything that the Braves do), that the bench is weak (the appalling lack of pinch hits from this team are a major reason why they struggle in close games), and that Joe Mather is not a good major leaguer. One other factor contributing to the Braves’ poor record in close games: Tim McClelland. Showing the value of a degree from Michigan State, McClelland put on the worst umpiring performance I have ever seen. I kept comparing him to Frank Drebin, with the major difference being that Drebin over-embellished every call, whereas McClelland couldn’t be bothered to make a strike call for several seconds after a pitch. McClelland’s third strike call on Freddie Freeman in the eleventh was unbelievably bad, as the pitch was both low and outside by several inches. In fact, the call was so bad that the Braves decided to show a replay of it on the big board as Tony LaRussa was over-managing by making a pitching change with two outs in the eleventh. I have never seen the Braves use the giant screen for the useful purpose of showing a call that went against the home team. Apparently, McClelland hadn’t seen such a tactic either, because he immediately started complaining to Fredi about it. You know, because it’s easier for McClelland to complain about the video board than to actually do his job by calling balls and strikes in a competent, consistent manner. I wonder if the choice of music - the main theme from "The Pacific" - is intentional in light of the fact that Barca will be playing a bunkered-in, fanatical opponent with no intention of doing anything more than taking as many opponents as possible with them.